Here below is an old slide I found in my archives where I list my known techniques for data conversion, i.e. how to push data into Infor M3, also known as data entry. This list intends to remind readers there are more solutions than the traditional techniques. API – The traditional entry point is to call M3 API. Advantages: it’s the fastest and most reliable technique, and the most widespread in terms of platforms supported, libraries, tools, and documentation. Disadvantages: there aren’t M3 API available for every program/field/operation in M3, as given by the M3 API Repository – MRS001. MDP – When there’s no M3 API available, we use the other traditional entry point, Lawson Web Services (LWS) of type M3 Display Program (MDP) to simulate a user going through the screens at the middleware level in M3 Net Extension (MNE). Advantages: with the Lawson Web Services Designer we can create the equivalent of an M3 API, for most M3 Programs, in almost no time. Disadvantage: it’s less efficient to run than M3 API as there are more layers to traverse. Those are the traditional techniques. And we massively call them with for example M3 Data Import (MDI), Smart Data Tool (SDT), M3 E-Collaborator (MeC), Visual Basic macros in Microsoft Excel, ProcessFlow Integrator (PFI), Infor Process Automation (IPA), Tibco, WebMethods, or custom Java/C#/VB programs, with the data coming from a source like for example a Microsoft Excel spreadsheet, a CSV or plain text file, or a staging database. If the traditional entry points fail, there are two alternate techniques. Manual entry – We can always do manual data entry. Advantage: it requires almost no skills, no programming, and no tools. Disadvantage: it can become humanly impossible to manually enter large amounts of data. MAK – Alternatively, we can write an M3 modification with MAK, to create a new API or modify an existing one. Advantages: it’s the ultimate solution. Disadvantages: it requires an MAK developer, it can take time, and M3 mods create a maintenance problem. MForms Automation – When there are no M3 API available, and when Lawson Web Services of type MDP fail for rare M3 programs, we can try to reproduce the steps with MForms Automation and write a Smart Office Script that loops thru a data source and executes the MForms Automation at each iteration. This is a proven technique and Seth will soon write a post illustrating this solution. Advantage: It’s the last card on the deck when you lost hope. Disadvantage: It’s less efficient because it’s at the user interface level. Macro – We can record the mouse movement and click events, and the keyboard keystrokes, and use a Windows program to replay them. Advantages: It’s the last solution available out of desperation. Disadvantage: it will break at the slightest change in window position or popup, and it will be slow. Finally, as a reminder, we never use SQL INSERT/UPDATE/DELETE to M3, as that would break the integrity of the ERP, it would bypass the cache of the data abstraction layer, and it would void warranty for support. That’s it! Thanks for reading. Subscribe below. 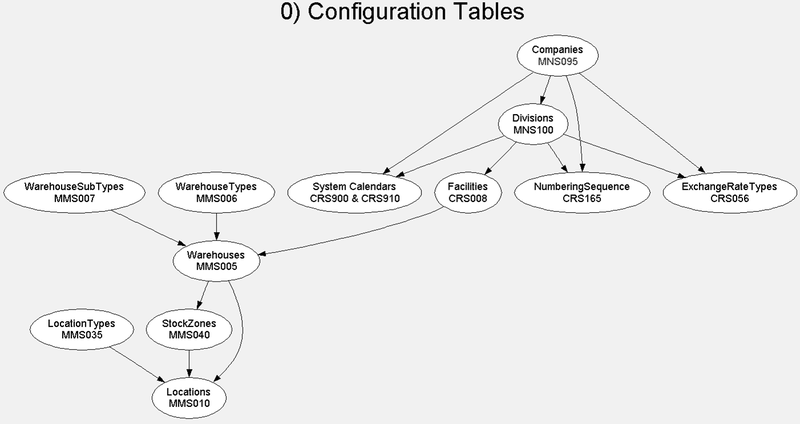 Dependency graphs show the relationships between M3 programs – how they relate to one another – and are useful during data conversion. In this article I discuss their benefits and how to create them. 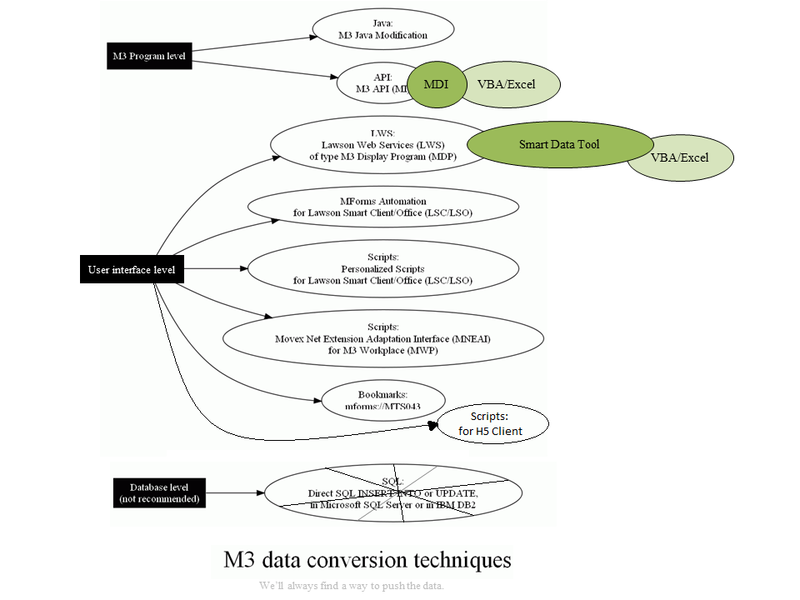 Data conversion is the process of transferring data from the customer’s legacy system into M3 with tools such as M3 API, M3 Data Import (MDI), Lawson Web Services (LWS), and Lawson Smart Data Tool (SDT) during the implementation project. Relationships between programs are governed by M3. The M3 Business Engine ensures the integrity of its programs. For example, to create a Warehouse – MMS005 we need to create a Facility – CRS008, to create a Facility we need to create a Division – MNS100, to create a Division we need to create a Company – MNS095, and so on. 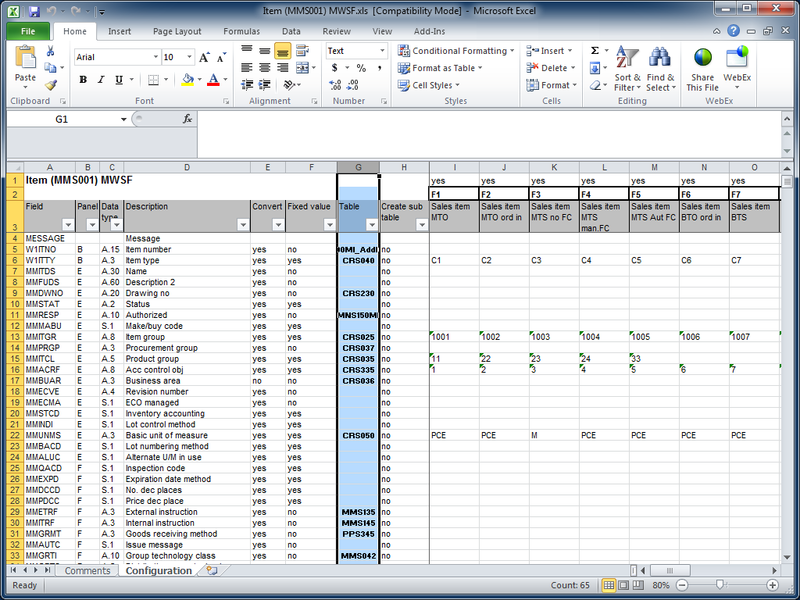 Smart Data Tool comes with Configuration Sheets that contain a curated list of M3 dependencies. It’s one of the best sources of dependencies available. We can programmatically extract the dependencies from the Smart Data Tool Configuration Sheets by reading the Excel files with ODBC/JDBC, or with Excel libraries available on the Internet (Java, VB, .NET, PHP, etc.). From those dependencies, we can automatically generate dependency graphs using tools such as Graphviz – an open source graph visualization software – in the DOT language. We can visualize large graphs in an easy zoomable way with a tool like ZGRViewer. Dependency graphs greatly facilitate the data conversion effort. We can generate them programmatically with a combination of tools including Lawson Smart Data Tool and the open source Graphviz.